1) Snuggies are all the rage, and I admit that if I got one I would use it, but aren't they really just backwards robes? "Denny's is offering a new breakfast dish called the 'Octoplet Slam'. It's 14 eggs, no sausage, and everybody else pays for it." 4) We got a fish for John-Paul's birthday. It's a yellow beta fish, and he named him "Mr. Buzz Lion Fish"
I'm just wodering how long his fish, ummm I mean fascination, will last! 5) I have a question about Lent. I gave up sweets, junk food and alcohol, except for Sundays of course!! But my dilemma is this: do granola bars and sugar free pudding count as sweets? A Fast Day on a Feast Day? As you all probably know, today is Ash Wednesday but also a double birthday in this house; John-Paul turns 6 today and I turn, ummm, errr, 20-10, how about that? Happy Birthday to my handsome, brilliant, sweet boy. You are my best birthday gift ever! We've celebrated this day three times already! First, my mom and dad had us over for dinner last week to celebrate and cooked my favorite meal, Chicken Cordon Bleu. Then, Phil's mom and dad got a cake and ice cream and we had a little party at the house this weekend while they were visiting. 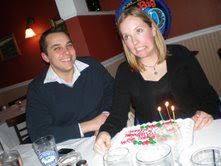 And on Valentine's Day, Phil completely surprised me by "taking me out for a Valentine's dinner" that was actually a surprise birthday party with friends and family. It was at an awesome Irish restaurant, complete with an Irish band. We had a great time, and I'm partied out! Today I am thankful for FAT TUESDAY. Mmmmmmm, the day where I can rationalize eating all the sweets and junk food I want since I'll be giving them up for Lent, starting the next day. Today is an extra special indulgence day this year because my birthday falls on Ash Wednesday, so there will be no cake tomorrow :( Don't feel too bad for me though, as I feel I have already had 3 birthday celebrations (which I will talk about tomorrow)! Ok, I'm off to eat some malasadas, coffee with sugar and cream, and maybe a piece of chocolate to top it all off. Vacation's over, now I need a vacation. This past week was February school vacation week here. I worked 5 days because Phil was able to stay home with the kids, and since it's tax season, there's a lot of work to be completed. Needless to say, Phil was super Dad and now he's super exhausted! The older boys went on two sleepovers (for the first time!). One at their Auntie's house, where they ended up sleeping in the same bed as their cousin, and once at their Gammy's house. They had a ton of fun at both, and got chocolate chip pancakes for breakfast...YUM! Okay, since I skipped Gratituesday and Thoughtful Thursday this week, I felt obligated to write a post for Frugal Friday. So this one is for those of you who like to eat out, and like to shop online. 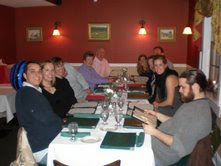 Go to www.restaurant.com and buy $25 gift certificates for only $10. Crazy, huh? price of alcohol can't be counted as part of the $25. Anyway, search for restaurants near you, read all the stipulations, and go have a cheap and tasty date!! Maggie thinks climbing up on the Exersaucer and reaching for the mixer seems like a good idea. She gets startled when she finally turns it on. Perhaps one day, she'll actually be a help to me in the kitchen! Cuz everyone else is doin' it. 1) I just went for a run yesterday and ran for the longest I have ever run at one time: 5.2 miles. I usually run about 4 miles, so I was pleased with myself! 2) I would love to run a marathon one day, purely for bragging rights of course. 3) In 9 days I will be turning thirty. Ouch, even typing that hurts. What happened to my twenties?? 4) I am number 5 out of 6 children in my family. We are all married and we all have kids. So, my parents have 6 kids, 6 kids-in-law, and 17 grandchildren! 5) I am completely Type A personality. Making lists and accomplishing tasks makes me very happy. 6) Although I LOVE to exercise, it is more for the mental health benefits than the physical health benefits. 7) I am addicted to tv. I am a faithful follower of 24, Lost, Fringe, House, The New Adventures of Old Christine, the Mentalist, Scrubs, The Office, and 30 Rock. 8) I used to ice skate (8 years) and play the violin (5 years). I'm okay with giving up the ice-skating but I wish I never stopped playing violin. 9) The older I get, the more I want to move someplace warm. 10) My eldest son was born on my 24th birthday (he was 5 weeks early) and has to be the best birthday gift I've ever received. 11) I used to want to be a doctor. I entered college as a biology major, but changed after one semester. I'm so glad I am an accountant now. 12) I am really proud of my siblings and their spouses. All in all, there are 4 doctors, 2 nurses, 2 lawyers, a Medical Salesman and a Computer Specialist. 13) There are so many times every day that I look at my husband and wonder how the heck I got so lucky. 14) I tend to have morbid thoughts. For example, if there is a small garbage bag on the side of the road, I instantly think it could be a dead baby. I know, it's disturbing. 15) I am afraid of the dark. 16) I feel so blessed with the life I have been gifted that I sometimes wonder when something's gonna go wrong. 17) I still LOVE to listen to pop music. Beyonce & Kanye West are current favorites, but only when the kids are not in the car. 18) I know all the words to "Ice Ice Baby" by Vanilla Ice. 19) If I could have picked Maggie's name without my husbands approval, she would have been named Niamh (pronounced Neve). My Hubby thought it was too cruel to do that to a child. I still like it and it's Irish spelling. 20) In my life, I've always had a few great friends, never a whole bunch of buddies. I just can't devote that much time and energy to so many people outside my family. 21) I love to travel. I've been all over Europe, to Canada, Mexico and Punta Cana, California, Florida, all over the North East and down to Virginia, across to Ohio and everywhere in between. When the kids are grown, Phil and I plan on travelling a lot. 22) I've been skiing and reading since I was 4 years old. Pretty impressive, right? 24) Blogging and reading other people's blogs has brought a sense of acceptance and has kept me sane! 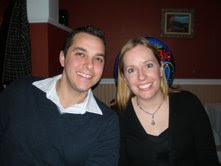 25) Although Phil and I are always struggling financially, we adore each other and our children. We have so many blessings (family, friends, our health, a nice home to rent, food in the fridge and on our table, tons of hand-me-down clothes and toys for our kiddos, Catholic schools, jobs, our pastor and many Priest friends) that we have no right or reason to ever complain. Wow, I didn't think I had 25 things to say. Now it's your turn. Yup, YOU! Please join me in praying for my friend, Laura's nephew, Jaime who is having surgery today. May God bless and guide the surgeon's hands, and keep little Jaime strong and healthy! Here's my money-saving tip that all of you probably already know. But I'll share anyway; get online banking. When you can pay your bills online, you don't have to pay for stamps, and you can set up repeating payments for those bills that you need to pay each month (mortgage, student loans, car payments, etc.). Plus, you can access your account anytime to see your balance so that you never overdraw and have to pay fees. And if you are lucky enough to have a bank like mine, you can even get paid 10 cents every time you make a "paperless" transaction. It takes a little bit of time to set up your account in the beginning, but once all the info is entered it actually makes paying bills a LOT faster. Save the planet, save a dime, save time and save stamps. What a deal!! Today I'm thinking about God's timing. Just the other day, Maggie turned 14 months old. Not a major milestone, no parties, no gifts, but it is kind of a big deal. Because I realized that when Eamon was 14 months old, I gave birth to Maggie. Now, thinking about my beautiful Maggie and how crazy she can be, I couldn't IMAGINE having a newborn to look after as well. I honestly can't believe that I had my third and fourth babies only 14 months apart. I remember trying to give Eamon his bottle of milk before nap time while nursing Maggie. I recall trying to time naps so that I could have at least ten minutes in the day when I wasn't holding someone, feeding someone, or changing someone. I can't believe Phil and I were up all hours of the night because not only was newborn Maggie waking up, but toddler Eamon as well. He didn't sleep through the night until he was 17 months old. I remember being dead tired, walking around in a foggy state of mind, and just trying to make it through each day. Phil and I would fantasize about the day that all of our children slept through the night. We hoped that one day, we would only have one child in diapers. We tried to hold onto the idea of going to a park or playground and having all four kiddos be able to run around and play; no babies in strollers, no bottles and diapers in the bag, and not having to chase shaky toddlers up and down the slides. Looking back, of course we would never have changed a thing. Because even moving the moment of Maggie's conception a fraction of a second would mean no Maggie. And that's a thought we can not bear. If we hadn't been completely surprised with Maggie, we might never have had a daughter. If Maggie hadn't been born so close in age to Eamon, Eamon might never have learned to be so independent, or to be as loving and protective as he is with her. And I know for a fact that I would never be as patient and trusting as I have become since the second we found out I was pregnant. I guess what I'm trying to say is that God's plans really are the best. We may not see the end result or the big picture at the time, but everything does happen for a reason, and I'm so glad He has blessed us with these particular little souls in His timing, not mine. Today I am thankful for chocolate, coffee, ibuprofen, heating pads and a patient & forgiving husband. How far can Mimi fly? My lovely husband told me about this game to play on the computer. He knows how much I hate cats (sorry PETA) so this is the perfect game for me. However, if you like cats, or even if you just have a nice soul and a loving heart...don't play it. When I was watching the Superbowl, I saw the most amazing thing: a preview for a new movie coming out called Race to Witch Mountain coming out next month. I LOVED, LOVED, LOVED these movies as a kid. 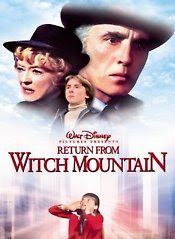 We didn't have too many videos, so my little sister and I watched Escape to Witch Mountain and then Return From Witch Mountain so many times. I honestly can hardly remember what they were about now, but I will never forget how much I adored these films. I wanted to be the girl with the long blond hair. Phil and I definitely want to buy these for our kids to watch when they get a little older. Mark your calendars for March 13th. Now I just need to borrow a preteen child from someone so I don't look like the only loser adult in the theater!!! Eamon: Yuckie, I don't like this juice. Me: I know, honey, but it will help your diarrhea. Eamon: But I don't like diarrhea in my cup!!! Today I'm thinking about technology and the affect it is having on our kids. Don't get me wrong, I think technology is a great thing; cell phones keep us safe in an emergency, computers and email allow us to work more efficiently, GPS systems help us out when we're lost, etc. I just can't help but feel that some of these technological advances are also dumbing down our children. My husband is a high school teacher, and when he grades a student's hand-written exam, he sees so many spelling and grammatical errors. We think it's because of two reasons; first - these students have automatic spellcheck on their computer so they don't really know how to spell, and second - they are so used to using text-slang ("ur", "lol", "ttyl") that they don't know how to communicate properly. Students nowadays also don't have to be able to do math in their heads, because they can use calculators on tests, and cash registers tell them exactly how much change to give back. My parents owned a family business, and I learned to count back change when I was about 12 years old. Now, when I try to give an 18-year-old cashier $20.61 for a $7.61 charge, and they get completely confused. It's ridiculous. Even my own kids don't understand the concept of regular tv. They think they can watch whatever show they want at whatever time they want because we have TiVo. They will also grow up using GPS navigational systems to show them how to get around instead of memorizing directions, or using a map. And don't even mention VCR's or typewriters...they'll look at you with a blank stare. I don't really know how to "solve" these problems. Should we get rid of our technology and go back to old-fashioned times? I really appreciate our gadgets, and think they provide valuable security and ease, but at what price to our children? Or maybe I'm just really over thinking this, and in the future, all of our cool gadgets will be so antiquated that I shouldn't have worried at all. Today I am thankful for TAXES. Yup, you read that right...taxes. But everybody hates taxes, you say? I hear you, and I sympathize with you, but I don't feel the same way for two reasons. The first is that because of taxes, I have a job. No taxes = no complicated tax returns = no need for accountants = no need for someone to pay me to do them. So I am grateful for my part-time accounting job that turns into an almost full-time job during tax season. The second reason I am thankful for taxes is that every year, based on our meager income and our not-so-meager family size, we get a big refund. Now, being a wise accountant (ha!) I know that getting a refund is not really a good thing. It merely means we gave the government too much money and they give it back to us a year later. We theoretically lost the opportunity to invest that money for a year, and therefore lost interest income. However, being a financial realist, I understand that money in the pocket/checking account usually translates into money spent. So getting a chunk of change once a year helps us to put a little in savings and pay off some debt (college loans, car payments, etc.). So thanks, Uncle Sam, for taxing us like crazy so that I can have a job and we can look forward to a yearly refund. My family and I are grateful!! Last night, for Superbowl Sunday, we had our normal football party, but with a lot more food than normal. We had chips and dip, tortillas with fresh salsa and queso dip, carrots and hummus, baked brie with apricots and walnuts, maple glazed meatballs, bacon-wrapped dates, chicken taco salad, chicken fingers, pigs in a blanket, and ice cream sandwiches for dessert! No wonder my belly hurts today...it's back to the Abs Diet this week. Anyway, all of that good food led me to this quiz below. Enjoy! When you're stressed out, you crave the company of those you love. Your comfort food is likely to be something you cook and share with others. In fact, stress often causes you to cook like crazy... even when you're not hungry. Taking care of people often wears you down, but it's also the thing that energizes you. I thought they said girls were supposed to be easier. Before I had Maggie, and I was a mom of three boys, I used to look longingly at the little girls who would quietly play by themselves, have tea parties with imaginary friends, and take care of their baby dolls. Then I would look back at my crazy, rambunctious, energetic boys and wish one day I would have a good little girl, and easy child, who would be content just sitting on my lap. Huh, apparently God had other plans. 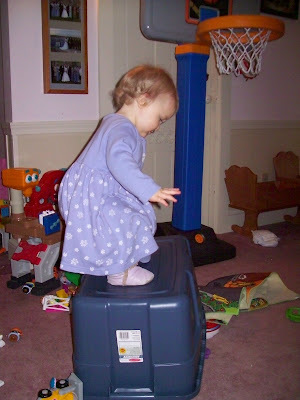 My little 14 month old daughter is CRAZY! Seriously, she gets into everything, all the time, and is much more dangerous. She climbs on whatever she can reach, puts anything she can pick up in her mouth, and has major tantrums when things don't go her way. She has an adorable devilish grin, and laughs when she's being naughty. And you know what? Most of the time she gets away with it because we are all wrapped around her little finger! 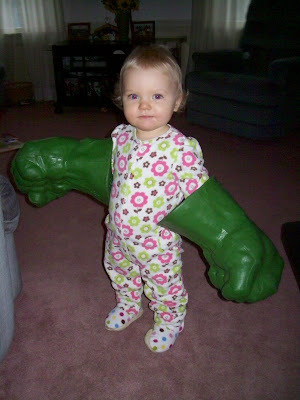 She went into the toy room and got these Hulk hands on all by herself...they are really heavy! 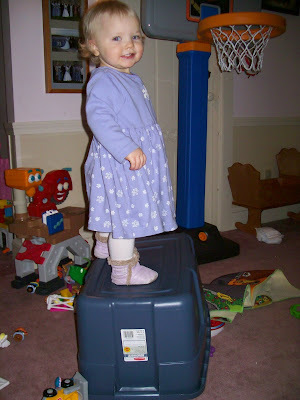 Here she is after dumping out all the toys, flipping over the container, and then standing on it.